ONYX Vantage 9590: In 1995, Nonin Medical revolutionized pulse oximetry by inventing the world's first finger pulse oximeter, the Onyx 9500. Today, Nonin's latest finger pulse oximeter for health care professionals, the Onyx® Vantage 9590, provides a fast, accurate, cost-effective solution for spot-checking oxygen saturation and pulse rate in pediatric to adult patients. Available in four colors – black, red, blue and purple. More information and specifications can be found here. ONYX II 9560: As the world's first wireless finger pulse oximeter, the Onyx II Model 9560 with Bluetooth® wireless technology allows clinicians to remotely monitor the blood oxygen saturation levels and pulse rates of patients with chronic diseases such as Chronic Obstructive Pulmonary Disease (COPD), Congestive Heart Failure (CHF) or Asthma. Wireless oximetry gives patients a new level of freedom and control as they go about their daily lives. The Onyx II 9560 is commonly used in eHealth applications around the world. More information and specifications can be found here. ONYX II 9550: The Onyx® II 9550 fingertip pulse oximeter provides fast, clinically proven Sp02 and pulse rate readings in the widest range of patients and settings for accuracy you can act on. The Onyx II 9550 is reliable and durable in the most demanding environments and has US Army and U.S. Military Airworthiness Certifications for use in helicopters. More information and specifications can be found here. WristOx2: The WristOx2™, Model 3150 provides highly accurate oxygen saturation and pulse rate readings in the widest range of patients and settings. From the hospital to the home, the WristOx2™is ideal for applications including cardio-ambulatory monitoring, remote wireless monitoring and overnight studies. It is simple and easy to use, and data can be downloaded via a USB cable or wirelessly with Bluetooth technology, providing patients with increased independence during continous monitoring applications. Also available in OEM configuration. More information and specifications can be found here. Nonin Medical has designed an array of PureLight reusable sensors for patients of many sizes and clinical presentations. 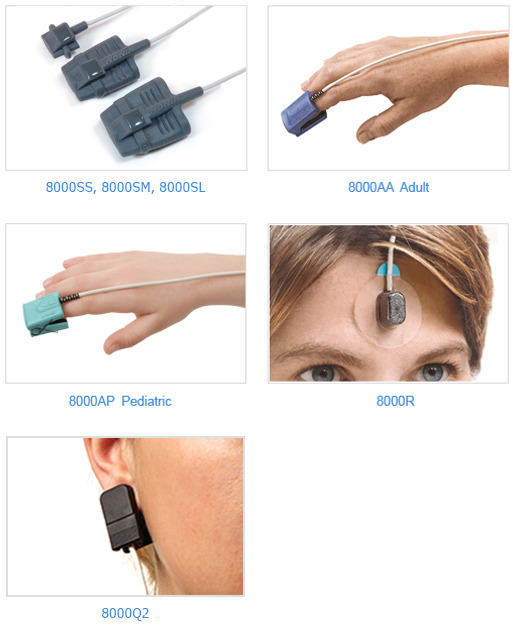 The 8000 Series of reusable sensors are ideal for spot-check, short-term or continuous monitoring. More information and specifications can be found here.